I’m a big fan of rooibos, or redbush tea as we English like to call it and it goes exceedingly well with a nice piece of chocolate cake. It was first introduced to me by CT way back when and I thought it was highly exotic. These days, I feel quite affronted if we’re out and about and a cafe or tea shop doesn’t stock it. I’ve never been a fan of black tea, preferring to drink tisanes, but rooibos started my journey into the custom of drinking tea. I’m still not a fan of straight black tea, but I regularly drink all sorts of green and white teas as well Earl Grey and chai. Rooibos is a South African leguminous shrub, Aspalathus linearis, the leaves of which are traditionally drunk by the native peoples of Western Cape Province. It has a beautiful copper red colour which makes it look particularly appealing in the cup. 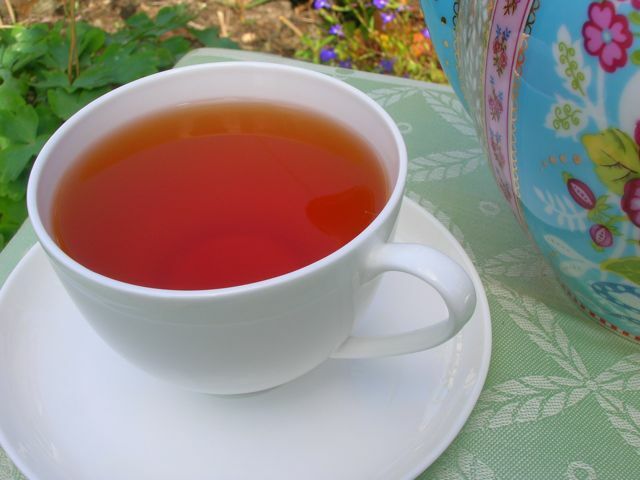 In addition to tasting good, rooibos has all sorts of health benefits. It contains vitamin C and is rich in flavonoids, which are powerful antioxidants; it seems that native peoples knew what they were doing when they took it as both medicine and tea. It’s also low in tannins which means if you leave the tea to brew for a long time, it doesn’t become bitter. And finally it is caffeine free. I generally drink rooibos without milk or sugar as I find it more refreshing this way, but it can be taken with either or both of these additions. An added slice of lemon makes for a particularly reviving cuppa. With a drop of milk, it becomes quite a different drink and tastes almost toffeeish, so if I’m feeling decedent, that is how I have it. I was sent a pack of 40 Twinings Redbush Tea teabags to review. We prefer to drink loose leaf rooibos as a general rule as we find it to have a cleaner taste and the leaves can be reused several times. But it has to be said that these teabags are highly convenient: no messy tea strainers or infusers, no tea leaves to clear out of the pot and clog up the sink, just a teabag to be thrown into the compost bin – easy peasy. We did get a second brew out of the bag, but it was significantly weaker. Much as I liked this tea, I was even more thrilled to be sent a porcelain Pip Studio teapot to brew the tea in. I have long admired this particular teapot, having spotted it on the web a few times and find it quite beautiful to look at. This is a teapot to flaunt, not to be relegated to the cupboard and should be proudly displayed at every opportunity. However, not only is this teapot a real beauty, it pours perfectly too. It has a 1.5 litre capacity, so is ideal for an afternoon tea party with friends or family. I can’t quite promise a completely non dripping spout, but of the four cups of tea I poured, I only got a drip on the last one. The teapot can be bought as part of the tea gifts range from the Twinings website where you will probably find a number of other desirables. For more tea inspiration, take a look at the Twinings online tea shop. You can find loose leaf, teabags and teas in caddies. They have a vast range including black, green, white, fruit and herbal tea. This is a sponsored post, but as is always the case on my blog, all opinions remain my own. I love twinings tea too. I like the smell of redbush tea (used to work in a cafe) although I don’t think I’ve ever tried it. Can’t believe you got sent a beautiful pip teapot, lucky you! Tea always tastes more special from a pretty teapot. I have to admit to not being a tea (or coffee) drinker at all, but that Redbush tea is such a beautiful colour. Perhaps I will have to try it! Beautiful teapot too. Here we have to differ. I can’t stand redbush tea, I’ve tried to like it but it just doesn’t do it for me. I love black tea and some good green teas, I guess that leaves all the redbush for you! I love Twinings tea. I have yet to try this brand though ! I like a nice, strong cup of Redbush tea. That’s a gorgeous teapot. I like redbush occasionally. I would love to get a teapot out like that – a lot of teapot envy here. LOL.